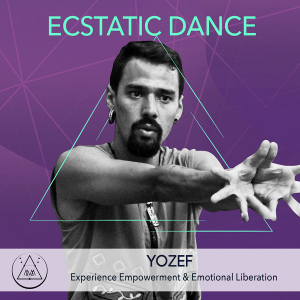 A journey in which dance-therapy, yoga and free movement blend together to create an experience of Empowerment & Emotional Liberation. We will begin through group dynamics and guided movements to integrate ourselves as a group and with our emotions to then explore the dancefloor through a new range of free movement guided by Music alone. NO SHOES, BOOZE, TALKING, NOR JUDGEMENT ON THE DANCE FLOOR. EXPRESS YOURSELF.HAVE FUN. HOW IS ECSTATIC DANCE DIFFERENT THAN A NIGHTCLUB? THERE’S NO ALCOHOL INVOLVED WHICH CAN HELP CREATE A POSITIVE SENSE OF SAFETY, INTENTION AND CLARITY IN THE ENERGETIC FIELD. SAFETY AND COMFORTABILITY IS VERY IMPORTANT AT ECSTATIC DANCE. PEOPLE GET TO FEEL LIKE THEY CAN SIMPLY BE THEMSELVES AND MOVE HOWEVER THEY PLEASE WITHOUT BEING JUDGED OR HIT ON ETC. THIS IS ALL ABOUT SELF-EXPRESSION, FREEING YOUR MIND AND BODY, AND CONNECTING WITH YOURSELF AND THOSE AROUND YOU. NO BOOZE, NO SHOES AND NO CHIT-CHAT ON THE DANCE FLOOR HELPS US KEEP IT INTENTIONAL. AMAZING MUSIC HELPS US KEEP IT ALL ABOUT DANCE. HOW DO YOU COMMUNICATE CONSENT WITHOUT TALKING? WE CAN COMMUNICATE CONSENT WITH OUR BODY LANGUAGE. TUNING INTO OUR BODIES HELPS US EITHER OPEN OURSELVES UP PHYSICALLY AND ENERGETICALLY TO SOMEONE, OR NOT. IF YOU DON’T WANT TO BE IN A DANCE WITH SOMEONE OR WOULD LIKE YOUR SPACE, PLACE YOUR HANDS INTO PRAYER POSITION IN FRONT OF YOUR BODY, THE GESTURE OF ‘NAMASTE’. THIS IS THE UNIVERSAL WAY OF SAYING ‘NO’ AT ECSTATIC DANCE, OR ENDING ANY DANCE YOU ARE IN, AND RECLAIMING YOUR OWN SPACE. A Yoga student for 10 years and a teacher for more than 7 years. He began his journey through an intensive course of Raja Yoga Meditation and Anusara yoga studies. He has had diverse experiences through different corporal disciplines including raja, hatha, anusara, ashtanga and kundalini yoga and also through aikido, tai chi and dance-therapy. He received his second Ashtanga Yoga training in 2015 and after that he made a pilgrimage trip to India in 2016 where he practiced asana in Rishikesh for 10 intensive days and received his fourth Vipassana retreat, a silence and meditation retreat 10 days in Sarnath, Varanasi. Today he teaches corporate yoga classes, Empowerment & Liberation workshops, directs his own yoga retreats all around Costa Rica and serves the board of ASOYOGA, the Costa Rica National Yoga Teachers Association as its President.